One of my favourite trends of 2017 is trash the dress. Although it's been around for some time, photographers who dedicate their whole career to trash the dress have inspired many brides to take the plunge and trash. The idea of trashing the beautiful, one of a kind wedding dress, that took months to find, seems scary to most brides. Afterall, it’s has a sentimental value and holds so many memories. That's where trash the dress sessions come into play. It reminds the bride that the dress is just material and the journey her and her new husband are about to embark on is what is important. The session is a time for the bride and groom to let loose and be creative, the sky is the limit when it comes to trashing your dress. The images that are made from trash the dress are so stunning and meaningful, the stress of wedding planning is gone and pure happiness shines through the in the images. 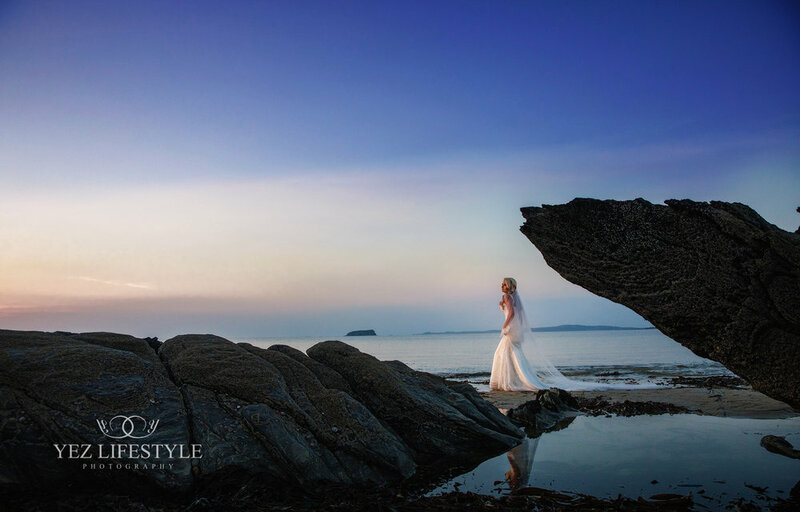 One of my recent brides Ella came to me with the idea of trash the dress, these are my first attempts at the concept on Ballyliffin beach and I can thoroughly say this was one of my favorite shoots to date, and the images are stunning. The session was a classic beach trash the dress which is so emotional and intimate. What I love about these sessions is that the bride (and groom) can make it whatever they want and go as extreme as they want with concepts such as fire and paint and as simple as water sessions, the options are endless. If you are interested in a trash the dress sessions feel free to contact me via Facebook, phone or email.